A great resource for working with children's comprehension skills. 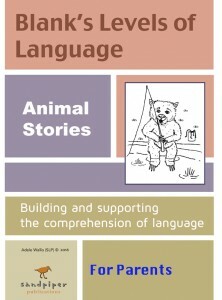 There are twenty short stories about various animal characters, who all live and work together. Each story follows through a particular event, and unfolds through a sequence of story telling and asking questions. Blanks levels of questions from levels 1, 2, 3 and 4 are embedded through the text, flowing from the narrative script and engaging the young child in the story and illustration.